The battle lines are drawn for the first Pro14 interprovincial of the season when champions Leinster arrive in the Galway Sportsground on Saturday (5.15pm ). The Pro14 and European champions will be in no mood to be overpowered by Connacht for a second successive fixture, having lost 47-10 in the final game last season. Already Leinster's Cian Healy has stoked the flames, suggesting John Muldoon's conversion of the final try in his last game at the Sportsground was "disrespectful", while Luke Fitzgerald not only agrees, but claims there is "real hatred" building in Leinster for Connacht. Whether just distasteful rhetoric to ignite the emotions and unsettle, Connacht will need to focus purely on themselves and their game because whichever team Leo Cullen brings to Galway, Connacht's task will be colossal. Despite that victory last season, it did not halt Leinster's march to another title, and understandably they are the bookies' favourites once again. As a result Connacht forwards coach Jimmy Duffy says Connacht need to remain focused on what they are good at. "Sometimes you can lose focus when you play teams like Leinster - they have massive quality, are in a good space and they are playing quality rugby, so for us it is important to focus on ourselves, areas where we need to be better, and reward the stuff we have been good at. "The reality is you have to work very hard against champions, and on Saturday we are playing the Pro 14 and European champions, an extremely serious outfit that demands the utmost respect, and we will prepare for a huge battle. "It is easy to take the eye off the ball, and the reason we have been competitive is because we have been focusing on what we are good at." For the first time a full house of 8,000 plus fans will throng the Sportsground, although Duffy says Connacht need to treat it like any other match. "It's an interprovincial at the end of the day, but it is also one of 30 games we play this season, and that is something we have to be focused on." Last Saturday's 33-20 win over Scarlets was a real fillip for Andy Friend's squad, helped in no small measure by Bundee Aki's inspiring form, allied to the control of Kieran Marmion and Jack Carty behind the scrum. Tom Farrell continues to thrive at the Sportsground, gelling well with Aki outside him. Add in the experience of Tiernan O'Halloran, alongside Matt Healy and Cian Kelleher, and Connacht have a backline capable of troubling any defence if they do not let the occasion overwhelm them. "We knew early in the season we had good young players," says Duffy. "We have a young squad, but an ambitious one. We had a good pre-season, toured well, and started pretty well. We were close against Glasgow - nine points up and disappointed we didn't close it out. But we have been building week on week, and last weekend showed us the potential that is in the group. The belief is starting to rise as well and that is something we are keen to support and resource." One of those youngsters is Paul Boyle who is expected to see some action on Saturday. The talented Wexford backrow player, who enjoys an affinity with the province through his Roscommon grandfather, was rested last week after making an impact in the opening three games, and Andy Friend would have no qualms of putting him into the fray on Saturday. Last season's victory for Connacht was memorable for the margin of victory and captain John Muldoon kicking the last conversion in his final game with the province. It was a gesture that was all about Muldoon and Connacht, and not about Leinster, although Healy's reignition believes it is. Duffy, however, says it had nothing to do with the opposition. "I didn't really pay attention to it, it was definitely something we didn't plan on doing. It was one of those things that happened before we realised it was going to happen - look it was definitely not a disrespectful moment, and that is important to point out." 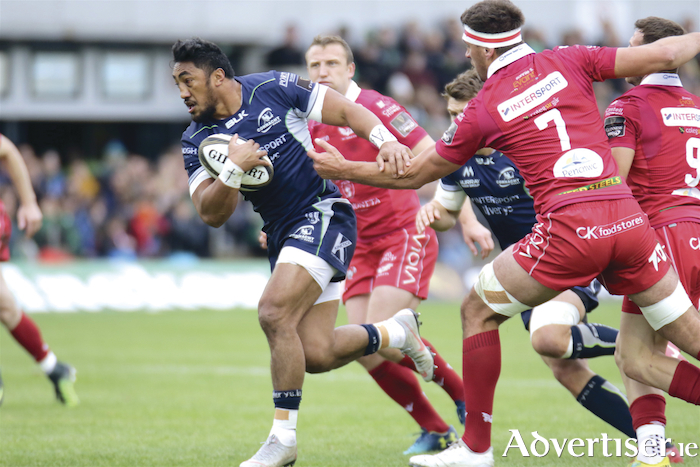 However the best place Connacht can continue to show their respect for Leinster is on the pitch, and once again they will need to show the "resolve and fortitude" they displayed against the Scarlets when they bagged a significant and timely 33-20 home win against the Scarlets. The stats tell the story - possession 68 per cent; territory 75 per cent. Centre Bundee Aki won the man of the match, but it could easily have been Jack Carty or Kieran Marmion. Aki, in his first start, bossed proceedings - "Unrelenting", said Friend. He set the tone, breaking through a crowded midfield before offloading in the tackle to Farrell to score. Right wing Cian Kelleher grabbed the second in the 25th minute to put Connacht in the driving seat. Carty, with a 100 per cent success rate, produced pin-point kicks behind the defence to put Scarlets under pressure, while Marmion's ability to scoop possession off the ground epitomised Connacht's appetite for possession; ditto his superb read to intercept a possible try-scoring opportunity for the Scarlets. As expected, however, Pivac's side demonstrated their confidence with ball in hand, running the angles to poach a try with Johnny McNicholl profiting from a missed tackle. Scoring machine Leigh Halfpenny, added the extras, keeping his side in touch. They did the same in the second half which Connacht controlled, and after a series of Carty penalties put them 26-13 ahead, Scarlets produced an end-to-end demonstration of clinical control, finished by right wing Tom Prydie to narrow the gap to 26-20.However replacement scrumhalf Caolan Blade continued where Marmion left off. Combining with the hard-tackling Sean O'Brien, he displayed a real doggedness at the breakdown to regain possession, and Niyi Adeolukun raced through to seal the issue. Connacht v Scarlets : T O'Halloran, C Kelleher, T Farrell, B Aki, M Healy, J Carty, K Marmion, D Buckley, D Heffernan, F Bealham, G Thornbury, Q Roux, S O'Brien, J Butler ©, R Copeland. Replacements, U Dillane for Thornbury (3 ), T McCartney for Heffernan (53 ), D Robertson-McCoy for Bealham, C Blade for Marmion, and C Fainga'a for Copeland (62 ), P McCabe for Buckley and N Adeolokun for Kelleher (64 ), C Ronaldson for Carty (78 ).